Last Tuesday, Josh and I went to see The Tempest at BAM. It was part of this year’s Bridge Project, and directed by Sam Mendes (aka Kate Winslet’s husband aka Hollywood Director). It was also my birthday present from Josh. It had been awhile since I read this play. I remember exactly when I read it actually: the summer between freshman and sophomore year of high school. 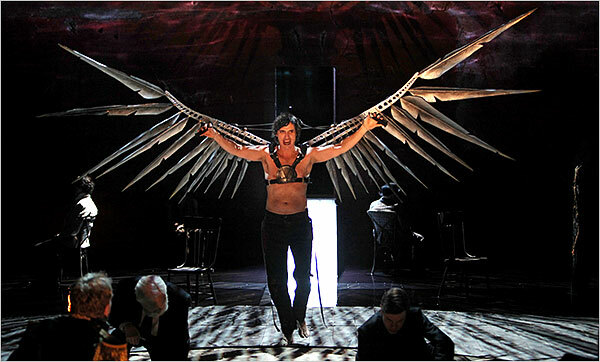 And I have to say, this production made me like the play even more. Seeing it performed made me look at the play differently as well. When the actors first appeared during the storm scene, I was a bit weary because of the modern-ish looking clothing. Sometimes I just don’t think Shakespeare should be modernized; it just ruins it for me. (In college, Josh and I had gone to see a production of Hamlet in Boston Common, and we ended up walking out of it during intermission. Thank goodness it was free!) But I had nothing to worry about this time around. The simple set with the circle of sand and water behind it was used wonderfully. I loved the fact that they didn’t focus so much on the “fantastical” part of the play. The production truly turned this play into a story about family and forgiveness and love. There were two musicians, one on each side of the stage, performing the music and the sounds of the island. At times, I forgot they were there, which is a good thing. I liked the little bits of noise that they tuned up. He recently did an interview with Time Out New York: You’re playing Charles the Wrestler in As You Like It right now, but I gotta say, I can’t wait to see what you do with Caliban in The Tempest next month. That character is such an enigma. Caliban is one of the most difficult characters to play because there’s not a lot of history there. It’s sort of a half-animal, half-man and there’s not a lot of background. So I’m working right now with a lot of movement, I’m studying a lot of different animals, cats and tigers and lions. I’m also working very closely with Stephen Dillane—who’s a master with the language—and trying to come up with my own interpretation…how to deal with the colonialism of the character, the 18th-century Romanticism of the character. But I’ve found another ingredient which I’m gonna try, which is the idea that Caliban is feeling love for the first time. I’m incorporating the bond that he made with Prospero and also the hate from having the island taken from him. We started talking about this idea of Caliban being Prospero’s id, or Prospero conjuring him up in his mind as he’s writing this story, so they’re sort of one and the same; you have to deal with both in order to be whole. And Sam is so open to interpretation and such a wonderful director in terms of letting the actor express himself and bringing in different ideas. We’re kind of a melting pot it right now. Oh and let me tell you…that study of different animals definitely showed. He was just fantastic! I would love to see him in more plays. 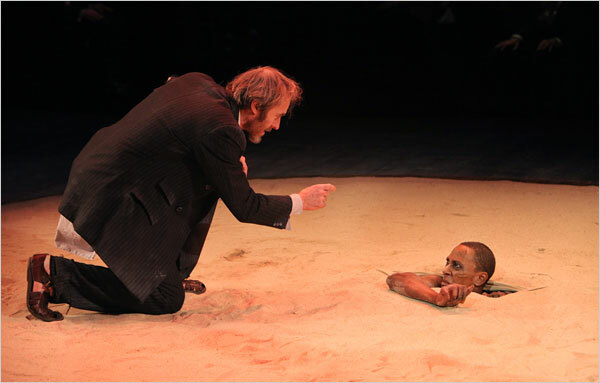 Here’s a great review of the production, and in it, you can see that circle of sand. 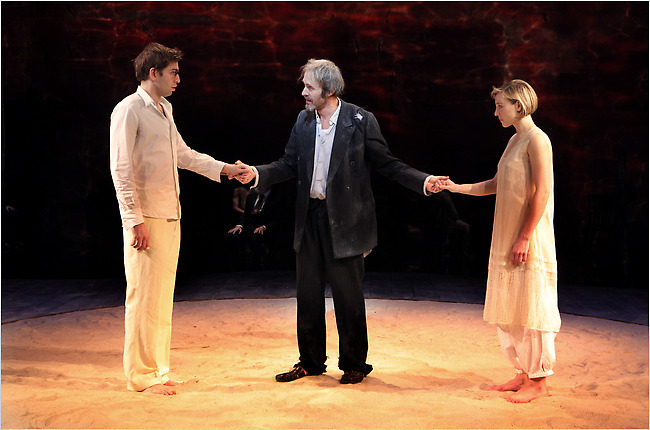 That sand circle was definitely a key element in the play: That’s where Prospero was able to have control over everything, where he bossed Ariel about, and where his magic was performed. This was the second Shakespeare production we have seen at BAM. The first being Macbeth, played by none-other than Captain Jean-Luc Piccard aka Professor Xavier aka Patrick Stewart. That, hands down, was the best Shakespeare I’ve ever seen, and not just because he was so good as Macbeth, but the entire production was just….well…creepy! In such a good way. And frightening. We still reminisce about it. So now we’re wondering what BAM will have lined up for next year. If you happen to be in the New York area, definitely check this out within the next two weeks. to seize your RSS feed to keep up to date with impending post. while that isn’t the same old rehashed material. Wonderful read!